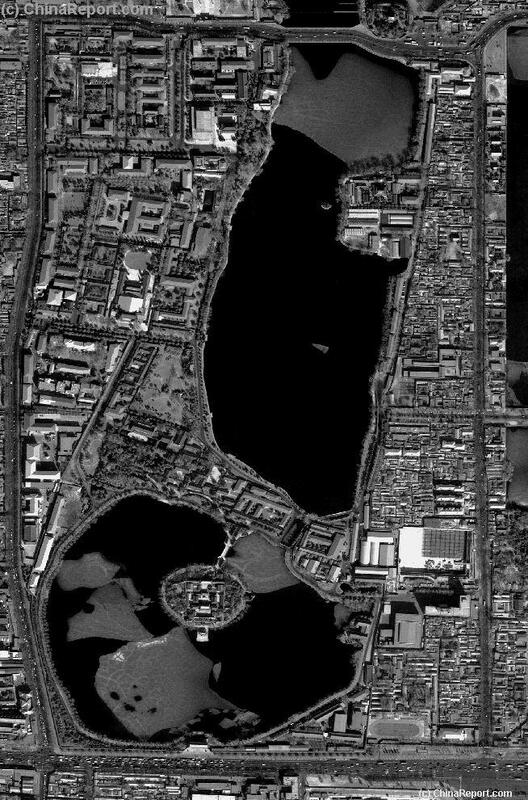 This Satellite Image shows an overview of Zhong Hai and Nanhai Lakes, once a part of the Imperial Palace (Forbidden City) next door. Zhongnanhai Compound is an exclusive security Zone since 1949 AD reserved as the Chinese Communist Party Leadership compound Zhongnanhai. The compound was ready after renovations in 1950 AD to become the Home and Headquarters of the Central Committee of the Chinese Communist Party and their families. Not much is known about the secretive Zhongnanhai Complex. 1) The most obvious is the South Main Gate stands along Xi (West) Chang An Avenue, is known as the Xinhua Men or Gate of New China, referring to the 1949 AD Declaration of the New Chinese Peoples Republic. 2) Famous as one of the Prisons for the troubled Guanxu Emperor during his captivity in the hands of the Empress-Dowager Cixi, Yingtai Island is found in the South of the Complex. 3) Third in importance is the so-called Building #202, which is where Mao Zedong lived in the last months of his Life and where he died on September 9Th, 1976 AD. 4) The Residence of Mao Zedong's hated wife Jiang Qing can be found as the Chamber of the Spring Lotus, although during the 1960's she had moved away to Diaoyutai, an elite guest compound just North of Zhongnanhai inside Beihai Park. Jiang Qing returned to the Chamber o/t Spring Lotus in june 1976 AD upon Mao's impending death. The Chamber of the Spring Lotus is a part of the former Palace Complex of the Empress-Dowager Cixi at Zhongnanhai. 5) Zhou Enlai's official Residence as Premier of China was the Hall of the Western Flower, in the extreme North-West corner of the Zhongnanhai Complex. 6) The buildings in the South-East corner of the complex, on the shores of Nanhai Lake were historically constructed as the private but grandiose Opera Theatre of the Empress-Dowager Cixi (in her final years in power). 7) Located just across Wenjin Jie', north of Zhongnanhai proper and just West of the South-West Gate into Beihai (Public) Park stands the #305 Hospital Building which services of all of Zhongnanhai and the highest Communist Party Cadres. According to Dr. Li Zhousui, the hospital building gives access to the 'May the 19Th 1969 Project' better understood as the secret underground tunnel complex of Beijing (I.e. not to be mistaken with the separate 'Beijing Underground City' 1960's air raid shelters, NOT connected to one another) in use by the top political leadership and military. Supposedly, underneath hospital building #305 is another clinic, underground, as well as access to the tunnels underneath Zhongnanhai, The Great Hall of the Peoples, Tian'An Men and others. 8) The Taoist Temple of the Thundergod in the East across Beichang Jie' is not currently a part of the Zhongnanhai Complex, but is not open to the Public. !! This Page is Best Viewed with Microsoft Internet Explorer (Browser) !! To Hall of Military Eminence of Outer Court. To TiananMen Square and Gate of Heavenly Peace , National Theatre Dome. Before ZhongNanhai became the Leadership Residence Compound of the Peoples Republic of China in 1949 AD, it was part of the extended Imperial Palace of the (later) Qing Dynasty. In 1887 AD, during the Reign of Emperor Xian Feng, The Imperial Palace was extended west-ward to include the Zhong Hai and Nan Hai lakes and their Western Banks. Clearly visible on the Right-hand of the Image (Arrow), the ZhongNanHai Palace Complex connects directly to the Purple Forbidden Cities' West Flowery Gate (Xi Hua Men) / Gate of Western Glory, that gives access to the Hall of Military Eminence (Wu Ying Dian), a part of the Outer Court of the original Ming Dynasty Palace. In the Past there was no north-south seperating road, and one could easily move in and out of the Palace Walls to enjoy the Lake and Parks at ZhongNanHai. The ZhongNanHai Park and Palaces are historically famous as the first location of imprisonement of the Guanxu Emperor（Reign 1875 AD － 1908 AD officially), folowing the so-called "Reign behind a Curtain". In this short period, after the 1900 AD Boxer War and the Young Emperor's daring 100 Day Reform Movement, the Emperor was imprisoned in his own Palace. First at the Water Terrace Pavilion on YingTai Island in Nanhai Lake, later cemented into his a room on the outskirts of the City at the (new) Summer Palace. Since 1875 AD it had not been the Emperor who held the reigns of power, it was China's most notorious feudal Lady, Empress-Dowager Hsu-Tzi aka Cixi the Dragon Lady. Summer Palace , where after the 1890 invasion and burning of the Imperial Palace the Emperor had fled, Reign behind the Curtain takes the viewer back to 19Th century Imperial Days and is an accurate depiction of the Coup D'Etat that brought China's most hated lady to power, as well as a true documentary of now forgotten chinese imperial culture. 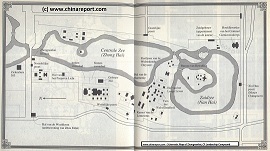 A Schematic Map of Beijings Secretive Zhongnanhai (Park) CP leadership compound just south of Beihai (North Lake) Park.